In light of the recent article I wrote on Wilson Combat’s 95 grain 9mm Barnes ammunition, someone asked me this week why I was testing so many light-for-caliber loads, so I want to preface this article with a short explanation of my logic. 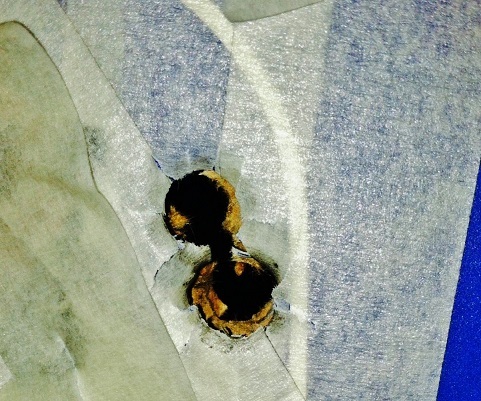 The simplest way to say it is that there is enough valid information out there to draw a perfectly reliable conclusion that a 230 grain HST bullet will perform devastatingly well in ballistic gel or on the street. Commonplace defensive rounds like that have been tested so thoroughly by so many people that the results are nearly ubiquitous with nothing more than a keystroke in Google. That doesn’t provide our readers with any information they can’t find on any other site. What I’m much more interested in is showing people that if you can’t reliably hit a target with a 230 grain +P .45 load, there is absolutely nothing wrong with a lighter bullet—even if it isn’t moving any faster. And so I set out to find some reliable defensive loads that recoil-sensitive individuals can trust to do the job. After all, hitting the target should be priority number one. But that doesn’t mean you can’t tailor the round you’re using to fit you as a shooter. The follow up question I received was “Why shoot a .45 that’s barely heavier than a 9mm?” There are a couple of answers to that question as well. First, because 1911s are widely carried and no caliber is more reliable in a 1911 than .45 ACP (for a variety of reasons). Secondly, a downloaded .45 still makes a bigger hole than a 9mm round—if a 9mm bullet expands in a given situation, a .45 bullet is very probably going to behave in a similar manner. There will always be factors beyond the shooter’s control in a self-defense situation and I won’t pretend to have the answer to all of them, but a .45 bullet with barely more felt recoil than a hot 9mm load has its merits for smaller shooters (or for smaller guns, like the XDs). 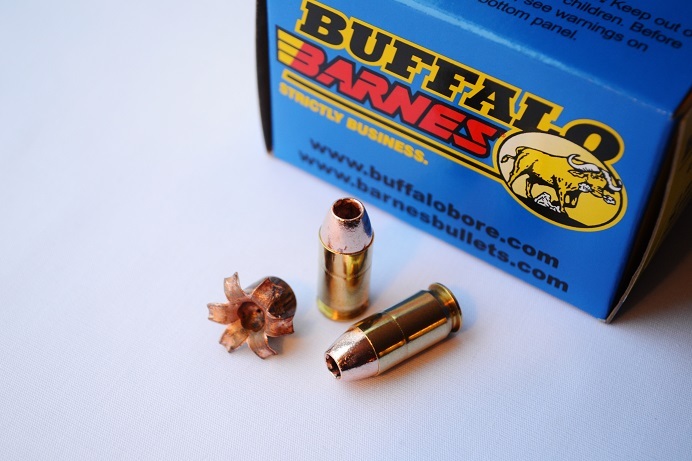 This load from Buffalo Bore’s Buffalo Barnes series uses a 160 grain Barnes solid copper projectile moving at an advertised velocity of 950 fps. For those of you who know almost anything about .45 ACP ballistics, you’ll notice that’s an awfully light bullet weight for .45 and it doesn’t move all that much faster than a lot of standard 230 grain loads. In fact, this Low Recoil 160 grain load moves about the same speed as most 185 grain alternatives. The trade-off here? Well, it might not be as much of a trade-off as you’re thinking…these rounds performed VERY well for us. 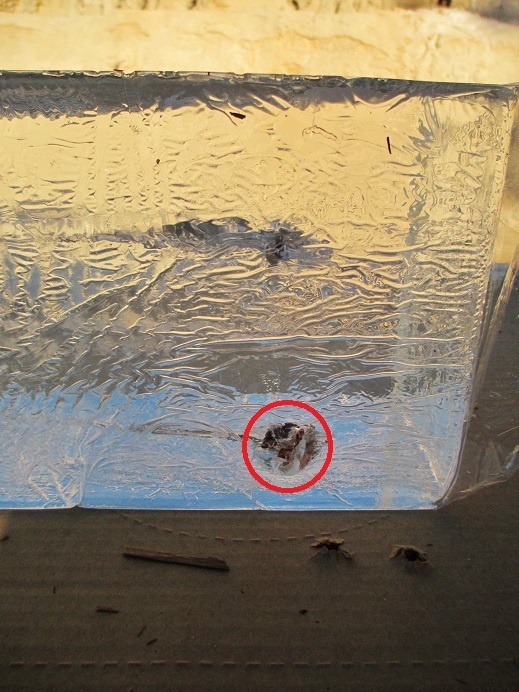 For the ballistics testing portion of the review, we once again relied on a Clear Ballistics 10% FBI Ordinance Gel Block to see how these rounds would behave in bare gel. It’s easy to see the rounds you fire and I trust their product to provide consistent and repeatable results. Buffalo Bore’s description estimated that the penetration of the 160 grain Barnes load would be something like 14-15″ in mammalian tissue. Not surprisingly, it performed nearly exactly to spec in the Clear Ballistics gel, reaching a depth of 13.75″ and impacting at a velocity of 995 fps. Moreover, this ammo was extremely consistent; the chronograph clocked most shots within about 20 fps of 995 through my 5″ Colt Series 70 1911. And the expansion? The bullet mushroomed to a diameter of .8125″, which is all the more impressive if you remember that the 160 grain bullet has shorter petals in the first place due to its lighter weight. This kind of performance is nothing to sneeze at, and it allows people with smaller hands, smaller wrists, or recoil sensitivity to put more shots on target—even out of larger-caliber handguns. Accuracy was outstanding, as I’ve come to expect from any of the Barnes bullets I’ve fired. Add to that the consistency we were seeing out of Buffalo Bore’s specific loading for this cartridge and you’ve got a winning combination. 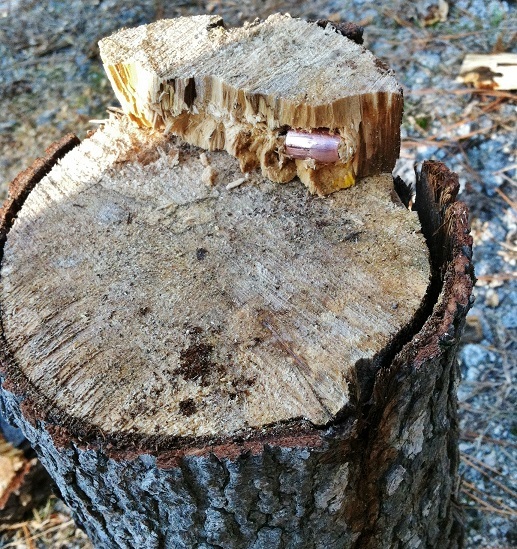 Case in point: the three-shot group at right was from 15 yards and wasn’t anything out of the ordinary for this load. The reduced recoil makes it easy to hit anything you’re aiming at if you do your part, and this remains particularly true for shooters who have a tendency to pull shots off target with “larger” calibers due to their anticipation of recoil (and the resulting over-correction that tends to follow). Over the course of the past few months, we have asked numerous female shooters to give this load a try, especially new shooters or women who hadn’t shot anything larger than a 9mm before. The feedback, across the board, was overwhelmingly positive. We loaded the Buffalo Bore Low Recoil 160 grain either immediately before or immediately after a standard 230 grain ball round, and then asked these ladies for their opinion as to which round “kicked” less. Without exception, that was the Buffalo Bore 160 grain Low Recoil round. And not surprisingly, these ladies were noticeably more accurate with this ammunition at distances from 5-10 yards. It bothers me to no end when I see a woman walk into a gun store and the first thing the guy behind the counter recommends to her is the lightest, smallest, most difficult-to-shoot thing in the store. A lot of women actually prefer a bigger or heavier gun because of the mitigated recoil. Moreover, since some ladies don’t feel comfortable carrying a gun with them all of the time, the gun that she can shoot the best is the best option—particularly since it will likely be coming out of the center console or the nightstand and not her pocket. 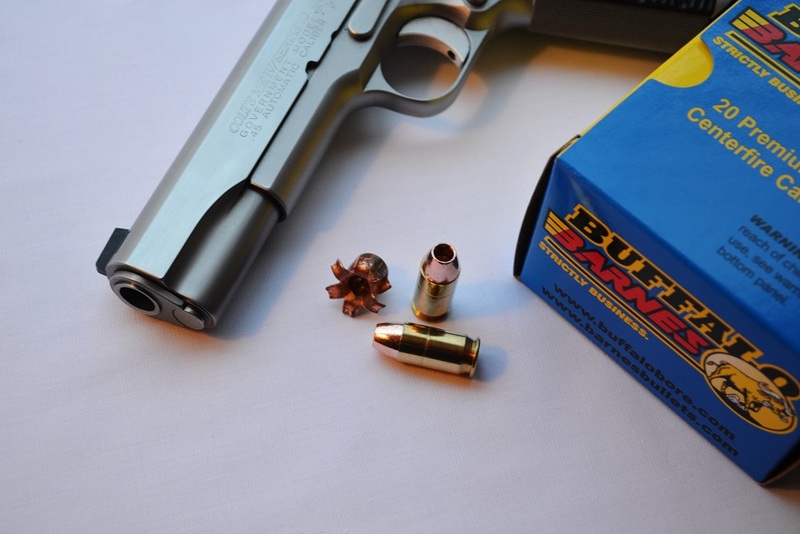 This round, coupled with just about any .45 caliber handgun, is very easy to shoot well. So to all you ladies who want to shoot a bigger caliber or a bigger gun for home defense (or to the guys who asked your wives what she wanted and found out she actually likes shooting a .45—kudos for doing that, by the way), this stuff should be near the top of your list. These rounds cycled and ejected 100% reliably in my Colt Series 70 .45 that is set up with a Wilson Combat 17# flatwire recoil spring, as well as in a number of other full sized and compact .45’s. And while I have relatively large hands, they cycled just as reliably for all of the female shooters who demo’d the ammo in the same gun. You could reduce the recoil spring rate to 14-16# if you wanted to, but there is certainly no need to do that from a reliability standpoint. For those of you who want to shoot suppressed, there’s another benefit here. Despite running faster than most 230 grain (except the stoutest +P stuff), this load remains subsonic even out of longer barrels, which means you can run it suppressed and have even LESS recoil with the addition of the suppressor’s weight up front. None of this is meant to patronize female shooters out there. I took my own advice here as well. My splits were sufficiently faster with this ammo that the first round in each of my carry .45 magazines is this load. I can get off one of these and follow it up with a second shot from a standard pressure 230 grain in a fraction of a second longer than it takes me to shoot just one of the stouter loads. Two is more than one, after all. This ammo is proof that you don’t need the heaviest bullet or the fastest velocity to have an effective self-defense round. Calibers could always be more effective, but past a point it’s a problem of diminishing returns. More velocity is good, but at some point it will cost you shots on target in the form of slower splits or reduced accuracy under duress. There’s no such thing as a handgun round that always stops the bad guy in one shot. So if you choose to carry a .45, you might as well pick a round that helps you get the second and third shots on target as well. If that means you need to lower the velocity a little, that’s nothing to be ashamed of. We will have a short-barrel ballistic test later this year, which this load will be a part of, but particularly out of a small .45 like the Springfield XDs, the advantage that a load like this provides with regard to getting shots on target—quickly—is substantial. And it should not be underestimated. Photos by author. Thanks to Buffalo Bore for sending us the ammunition sample used for this review! We were not compensated in any way for the review outside of the sample, and the testing data was all unbiased and objective.